This 120-page DOWNLOADABLE Carpet Buying Guide is the culmination of two great books, "The Quick and Easy Guide to Carpet Shopping", and "Carpet Buying Secrets revealed" Both By Alan J. Fletcher. This updated, new and complete carpet buying guide offers all the information revealed in both books, but at a fraction of the price. And so much more! It's 100% Guaranteed to save you time and money! 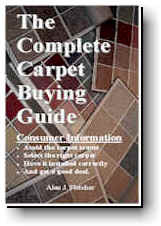 Consumers can now get all the carpet buying information they need for Only $9.95 This is a truly great and valuable resource for consumers who plan on buying carpet for the home office or rental. Thousands of satisfied carpet buyers ensure your complete satisfaction. You need Adobe Reader to view or print this e-book Get Adobe Reader now Free! After payment is received you will be re-directed to my special web page where you can download your E-Book instantly!